“They didn’t care if my child was sick. They said work is work and fired me the same day,” Jimenez, 37 of Elmhurst Queens and a Colombian immigrant, said. According to The Bureau of Labor, 37 percent of the lowest-income workers in the New York City area can’t take a single day off and get paid. 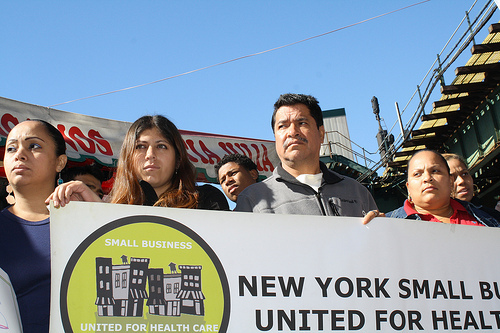 Yesterday, Jimenez and others rallied to promote the passing of the New York City Paid Sick Leave Bill. The bill proposes nine paid sick days a year for businesses with 20 or more employees and five days for businesses with 19 or fewer employees. Make the Road New York, a local organization that promotes economic justice, equity and opportunity for all New Yorkers throughout the community, organized the rally. Their 7,000 plus members are primarily low–income Latino/a immigrants, 75 percent of whom are women. It’s been less than a week since Ruth Jara, a 49-year-old Ecuadorian immigrant living in Corona, Queens was fired from her restaurant job after missing one day of work to take her child to the doctor. “They told me, if you don’t come back, you’re out of a job,” Jara said. This is the same restaurant that when she cut her hands on the job, her employer gave her a dirty rag as a bandage and told her to keep working. According the Bureau of Labor, 85 percent of employees in the restaurant industry do not get paid sick days. The Partnership for New York City, released a survey that the City Council’s Paid Sick Leave Bill will cost businesses $789 million.